As many of you know kanban is a Japanese term that typically is related to a signal of when to produce (make) or withdraw (move) items in a manufacturing setting. Nowadays, Kanban Systems are used in office areas, hospitals and other industries wanting better control of their processes and inventory. 5S Supply has partnered with Hurst Green Plastics, Ltd from the United Kingdom to provide their award winning TwinBin and FlagBin Systems. Employees pull parts from the lower bin as needed. When the bin is empty, a pull of the divider drops the correct quantity of replenishment parts into the bin. This also visually triggers replenishment of parts in the top bin. The top bin is then restocked and the pull system continues to provide the right product in the right quantities! 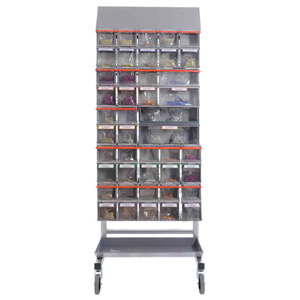 The clear front plastic bins allow operators to easily see exactly what parts are needed and the current quantity. The bins can be color coded and labeled to make the system even more visual and simple to operate. An upper Locking Bar (in three colors: Red, Blue and Grey) to help prevent people from pulling components from the top bin. Since these items are shipped form the U.K., 5S Supply uses a Request for Quote form to customize solutions. For more information visit our website: TwinBin Kanban System or call us at 888 4 LEAN 5S (888-453-2657).